ON a recent golf trip to South Carolina I showed off to the rest of the foursome by taking along my brand-new Kindle 2. No one seemed impressed that I had already stored on it practically all of Trollope and six volumes of Gibbons’s “History of the Decline and Fall of the Roman Empire,” along with the latest Lee Child and Dennis Lehane. It’s not. The reading device of the future will surely be backlighted, unlike the Kindle, so you can read in the dark. It will have different typefaces, and will reproduce photographs and illustrations in something better than a murky gray wash. The read-aloud voice will learn how to pronounce “Barack Obama” and will have mastered a tone more expressive than that of the tiresome know-it-all who talks to you from inside your car’s G.P.S. In the future airlines will also conclude that you don’t have to turn off a reading device during takeoff and landing. On the way back from South Carolina I had to dash into an airport bookshop for a backup paperback, which sort of defeats the whole point. 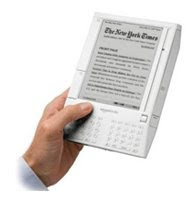 But if the Kindle isn’t the future, exactly, it’s a precursor. What it tells you, even if you are an unreconstructed book lover, is that the future will not be as hard to get used to as you imagined. Books are heavy, the Kindle reminds you, and they take up a lot of room. Read the rest of this piece at NYT online.